Artwork ©Bill Thomson. All rights resrved. Stockbridge, MA, June 25th, 2018–In conjunction with Norman Rockwell Museum’s new exhibition, Keepers of the Flame: Parrish, Wyeth, Rockwell and the Narrative Tradition, the Museum will hold a discussion that examines artistic influences. Roots of Inspiration: Contemporary Artists Speak will pay tribute to the artists, peers and mentors that inspired accomplished illustrator/educators Doug Andersen, C.F. Payne and Bill Thomson. The event will start at 1:30 p.m. on Sunday, July 22, providing visitors with an abundance of advice, meaningful stories and inspiration. Keepers of the Flame curator, Dennis Nolan, will host the exclusive art discussion. 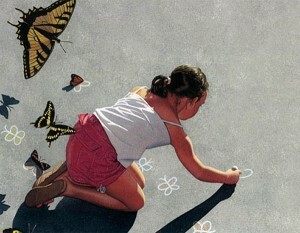 Each illustrator/educator brings a unique perspective in the narrative tradition. Doug Andersen has more than twenty-five years of teaching expertise, holding the title of Assistant Professor of Illustration at the University of Hartford. Andersen has also worked twenty years as a freelance illustrator, including for the science fiction game and book cover market. Andersen has technical illustration and conceptual painting experience with Lockheed’s Space Systems Division, where he was an art director and has even illustrated the beginning stages for the Mars landing proposals. C.F. Payne’s artwork and illustration has inspired numerous, prominent museums, including The National Portrait Gallery, The Society of Illustrators Museum of American Illustration, and the Norman Rockwell Museum, to showcase his work. In addition, Payne’s cover illustrations have appeared in prestigious magazines, including Time Magazine, The New York Times Book Review, Sports Illustrated, and Readers Digest. Payne works as a children’s book illustrator and provides freelance work for politicians and authors. Bill Thomson has used his creativity and inspiration in numerous fields, including designing artwork for books, clients and advertising. Thomson’s work has collected many awards, in both juried competitions as well as receiving the American Library Association’s Children’s Book Notable Award and the International Reading Association’s Teacher’s Choices Award in addition to more than seventy-five awards. Thomson is a children’s book illustrator and a Professor of Illustration at the University of Hartford. The talk is free for Museum members, or included with regular Museum admission.